The Norwegian browser Opera launched an innovative mobile based service called the Opera Web Pass. It is an emerging market-focused service aimed at making mobile Internet packages more straightforward for phone owners and inexperienced web users. Usually the companies charge per MB data consumed by the user. But the Opera Web Pass lets the users browse the web on ‘pay-as-you-go’ basis through the Opera Mini browser giving them the choice of websites they can visit and the option of paying only for accessing those websites. For example, users get customized access for limited time to Twitter or Facebook (say $0.50/day for accessing either one) or unlimited web browsing for $1/day. 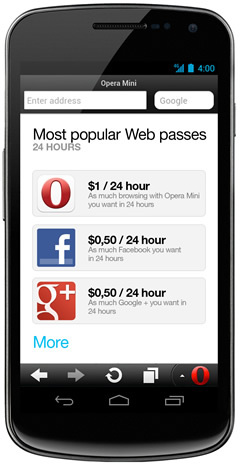 The Opera Web Pass mainly targets the folks who use mobile internet to visit only specific sites. Another significant feature of this service is it uses Data Optimization Technology. It allows the users to load more pages while consuming less data, thus making the whole process more cost effective. Opera is very optimistic with this solution especially for developing markets where people look for cheap and simple one-click solutions. The service can be easily tweaked to support functionality like third-party billing, while it boasts that the new service is “quick, scalable and cost-effective”.